It is all very well and good being constantly on the search for music that makes you feel alert and alive and full of visceral blood-pumping, foot-stomping, hip-swaying beats and thrills and then there are the times when your soul needs feeding something more ethereal. Something to transcend you to a more mellow state of being and ladies and gentleman I have that right here for you in the form of Jordan Mackampa’s debut EP, Physics. From the first crackle and first note of velvety vocal I was instantly captivated. I was in the middle of doing something else but I became so lost in opening track Open Arms that I have no idea what it was I was doing. Story telling at it’s best; open and honest. As with many songs, the theme is love, but there’s nothing trite here, it might not be breaking down boundaries, but it is breaking down emotional barriers, mine. Changes in pace within an EP are something that I believe is key to keeping interest, especially when themes are often so closely intertwined. Physics manages this perfectly, not just with tracks but within tracks too. Yours To Keep has wonderfully soft percussion which pushes every forward, alongside the fast finger picked guitar, both in contrast to the beautiful sway of the vocal melody. I can’t help but think of Toy Story when I listen too this “I write your name on the bottom of my shoes, just so you know I’m yours to keep” – of course, this is no bad thing, who hasn’t got to the end of Toy Story 3 and looked at Andy’s name at the bottom of Woody’s shoe and whimpered a little at the romanticism in it all. Jordan Mackampa’s vocal washes over me and as it does it feeds me somehow. It’s soulful, emotive and sound’s like it’s so easy for him. Those low notes he hits on Midnight make my nose snarl up in equal amounts of disbelief and delight. Beauty comes in many forms in music for me and this soul led folk sound often speaks to me and it’s been missing from Popped for a while. 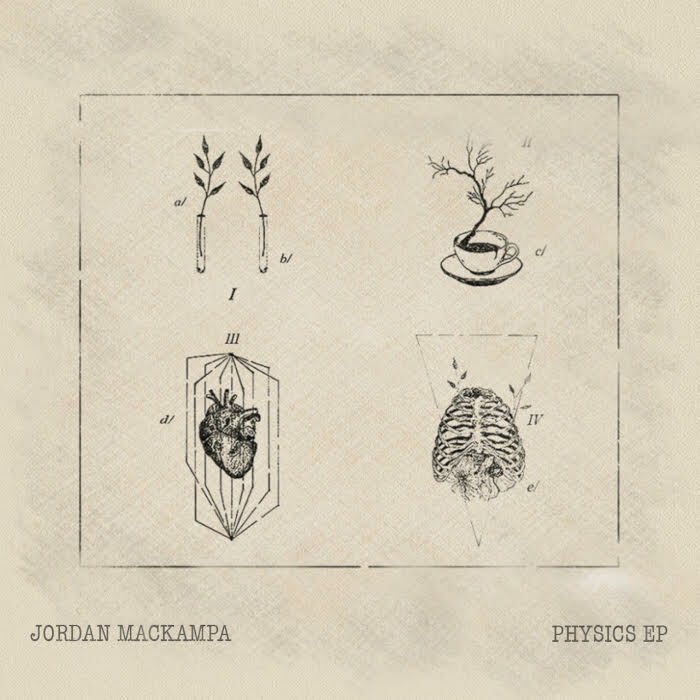 So glad that Jordan Mackampa’s Physics EP landed at my lap right time right place and interrupted my day. As much as I dislike saying this kind of thing, In time I think he could be someone to rise through the ranks to join the likes of Ben Howard and Michael Kiwanuka in my, and many other’s, musical affections.